Bhringraj plant also popularly called Karisalankanni in Tamil is an amazing herb with wonderful medicinal uses and health benefits. It is especially very well known in India for promoting hair regrowth and has been used in Ayurveda for more than thousands of years for treating lots of other ailments. Both fresh bhringraj leaves and bhringraj powder are used for promoting hair growth. Bhringraj oil also called karisalankanni oil made using the leaves is very famous in India and regular use of the oil promotes fast hair growth. 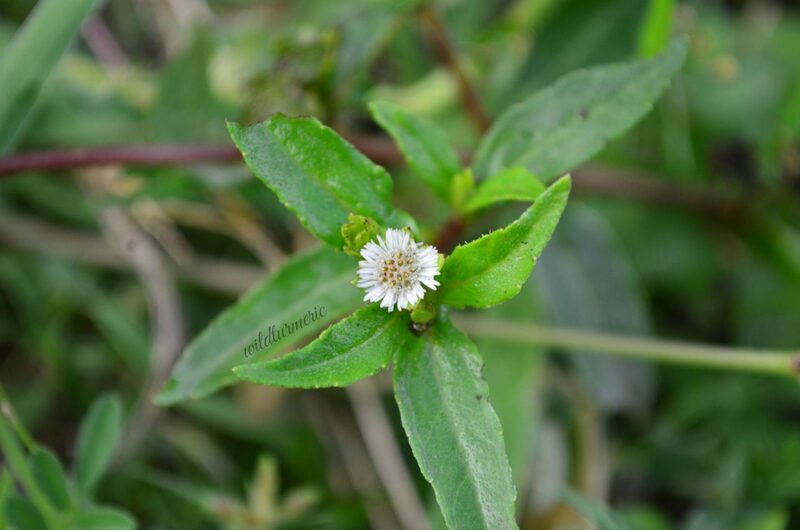 The botanical name of bhringraj plant is called Eclipta Alba. Bhringraj is the Hindi name and Karisalankanni is the Tamil name. It is called Guntagala Aku in Telugu, False Daisy in English, Gargamuru in Kannada, Tekaraja in Malayalam, Bhangra in Punjabi, Bhangro in Gujarati and Kesuriya in Bengali. 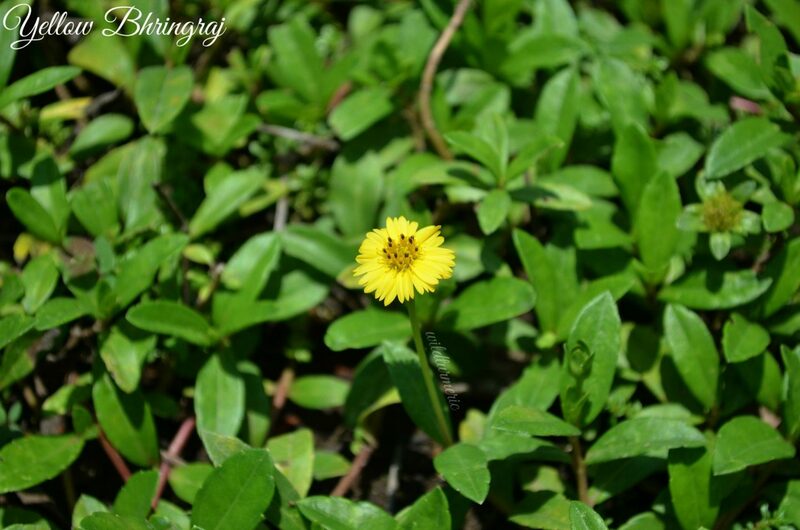 Bhrigraj is a small plant with long leaves and white or yellow flowers. We can easily identify the plant with the flowers and it grows well in moist places. Bhringraj can be found in most tropical countries. I prefer to use only the fresh herb so I always grow bhringraj plant in the garden and I strongly suggest that you grow this amazing herb in your garden too to enjoy it’s many health benefits. This plant needs very little to no maintenance. Regular watering and little bit of natural manure will be enough to maintain this wonderful plant. In Tamil Nadu, bhringraj is considered a sacred herb and is valued very highly for it’s hair growth promoting properties and for improving the overall health. Try to include this herb in the diet of young children too. If consumed from an early age, it will protect them from many diseases. The best way to consume it is to include it in our dhal or just make a simple filling for dosa by frying onions in little bit of oil and then add the greens and saute well till it is reduced in quantity and is cooked. Now add little bit of pepper powder, salt and little bit of freshly gated coconut. Saute well till there is no moisture left. Use this as a filling for dosas, sandwiches and rotis. Continue to include this herb both in the diet and as an hair oil regularly to get beautiful shiny hair and healthy body. There are two varieties of bhringraj that are very commonly found all over India, one produces white flowers and the other produces yellow flowers. Though both are used for making bhringraj oil, the white variety is most preferred as it gives the best results. Some of the chemical constituents isolated from bhringraj leaves are wedelolactone, stigmasterol and desmethylwedelolactone. Some of the important chemical constituents in bhringraj roots are hepatocosanol, stigmasterol, ecliptic, eslalbatin and hentriacontanol. Some of the important chemical constituents of bhringraj seeds and steam are wedelolactone, ecliptalbine and sterols. Some of the important compounds that are responsible for the amazing medicinal uses of bhringraj are wedelolactone, eclalbosaponins, demethylwedelolactone, dasyscyphin, ecliptalbine and eclalbatin. Like I mentioned before, bhringraj has been used for promoting hair growth from ancient times. It is also used for treating dandruff, hair loss, grey hair and strengthening the hair follicles. This traditional use has been proven through clinical research, you can read the study that proves it here. Another amazing use of bhringraj is it’s anti cancer properties. It has powerful anti cancer properties that helps fight against cancer cells. It has been proven to be effective against many cancer cells including breast and liver cancers. You can read the study proving the anti cancer properties here. Another lesser known medicinal use of bhringraj is it’s ability to treat and protect us against hepatitis. In fact bhringraj has been used for treating almost all the problems of the liver including liver cirrhosis, liver enlargement, liver cancer and also infective hepatitis. The compounds responsible for anti hepatitis properties are wedelolactone, luteolin and apigenin.You can read the study proving it’s anti hepatitis properties here. Another interesting use of bhringraj that not many know of is it’s ability to kill the Aedes variety mosquitoes which are responsible for causing dengue fever and chikungunya. Out of all the extracts, the methanol extract proved to have the most larvicidal and ovicidal properties. You can read the study that proves it here. Bhringraj also has a positive effect on our nervous system, traditionally bhringraj extract has been used for improving memory and learning. Bhringraj has a calming effect, reduces aggressiveness, improves our memory and greatly helps in learning, you can read the study that proves it here. Since bhringraj has antihyperglycemic properties, consuming bhringraj will help reduce high blood sugar levels and will have a positive effect on diabetic patients. It also helps reduce some of the side effects associated with diabetes like diabetic nephropathy which refers to kidney damage due to high blood sugar levels. Along with reducing blood sugar levels it also helps reduce high cholesterol and blood pressure too. Malaria is life threatening disease caused by mosquitoes that are infected with plasmodium parasite. There are many herbs that have wonderful anti malarial properties and bhringraj is one such herb. The leaf extract has been proven to be effective against malaria. You can read the study that supports this claim here. Bhringraj extract can be used for treating small skin wounds and inflammation very effectively. The water extract can be used as an anti bacterial wash for wounds and scrapes. Many people are suffering from scalp inflammation, for them using bhringraj hair pack or oil will greatly help reduce the inflammation and pain. Bhringraj like I mentioned before is a wonderful nerve tonic and has been used for treating many neurological problems. The compound luteolin found in bhringraj has anti convulsant properties and when taken internally greatly helps reduce seizures. You can read the study that supports this claim here. Bhringraj has wonderful anti bacterial properties too. It has been proven to be effective against both gram positive and gram negative bacteria. 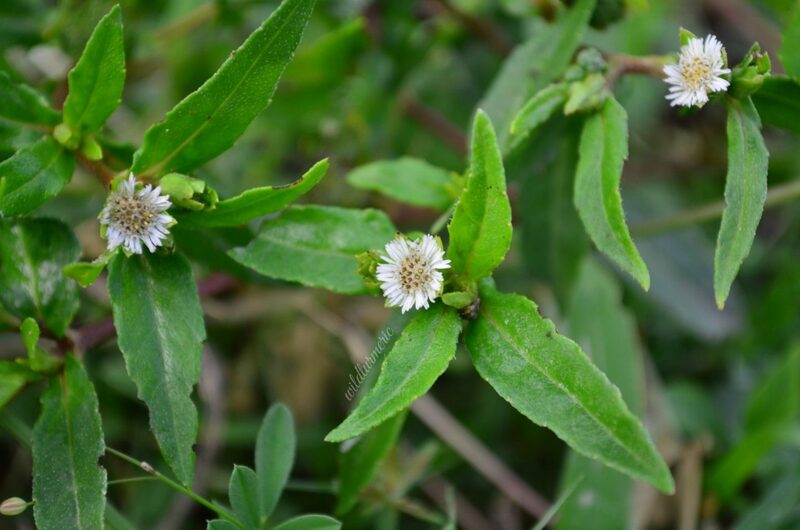 Certain isolated compounds from eclipta alba like eclalbasaponin also has been proven to be very effective against many strains of bacteria. How To Use Bhringraj For Hair Growth? The best way to use bhringraj for hair growth is by using it in the form of hair oil. Bhringraj hair oil is an amazing hair treatment that solves many hair problems. We can also use bhringraj powder for promoting hair growth by including it in hair packs too. Including bhringraj (karisalankanni) in the diet regularly will prevent anemia and all liver related diseases. How To Make Bhringraj Powder? To make bhringraj powder, take bhringraj plant, wash well and spread on a kitchen cloth to remove excess moisture. Now sun dry till crisp and powder in a dry mixer while still crisp from sun drying, sieve to get a fine powder and store. For health reasons, take 2 teaspoons of fresh bhringraj juice a day. If you don’t get fresh leaves, you can try using the bhringraj choorna that is available everywhere now. If you don’t like to consume bhringraj powder (bhringraj choorna) then try bhringraj capsules, If taking in capsule form, take 1 bhringraj tablet per day (250 mg). This plant is generally very safe if had in the mentioned dosage and if consumed as regular greens in our food, it rarely causes any side effects. But if you take bhringraj capsules and over consume them, it might have some side effects………. The best way to use bhringraj for hair is by making a hair oil with it, bhringraj oil has amazing hair benefits. It prevents hair fall, premature greying, strengthens the hair roots, conditions the hair well, prevents split ends, stimulates hair growth, prevents baldness, premature greying and alopecia – in short everything that is needed for a healthy hair. Nowadays bhringraj oil is marketed everywhere but you can make your own pure bhringraj oil at home very easily. I prefer to use homemade coconut oil that is not refined for making this oil and I would strongly suggest that you do the same for best results. This oil can be made in two ways, the first method is made by grinding the bhringraj leaves without water and making it into small rounds and then sun drying it till crisp. 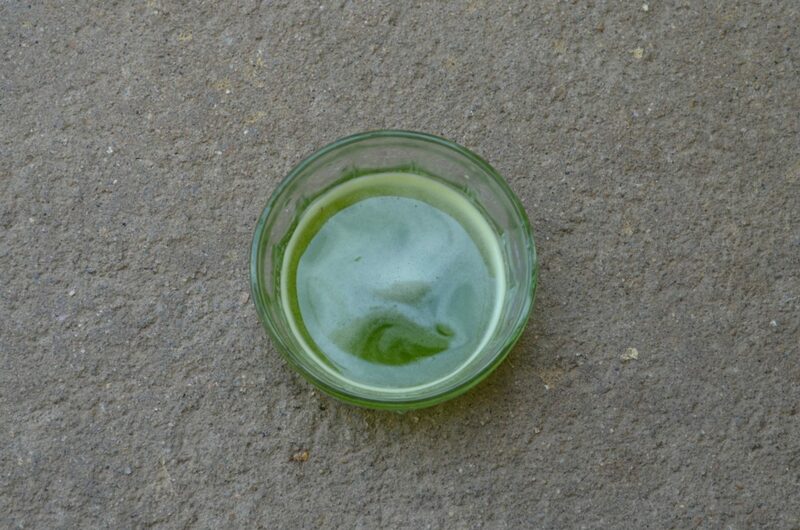 Then the rounds are added to coconut oil in a glass jar and placed in hot sunlight till the color of the oil changes. This method takes around 3 to 4 days for the bhringraj balls to dry and for the coconut oil to get heated up. This method is best done during hot summer months. I made the bhringraj hair oil using the second method which is done by directly heating the paste in coconut oil. This oil has a beautiful green color and a unique pleasant smell. When I made this oil, the whole house was smelling of this oil. To use this oil, massage it well into the scalp before having your hair wash regularly and let it soak for at least 30 minutes. This oil stores well for up to 3 months at room temperature. This bhringraj hair pack made with bhringraj leaves will prevent baldness. To make the hair pack, take equal quantities of bhringraj powder, amla powder and methi powder in a cup. Mix the powders well together, now add enough yogurt till it forms a thick but spreadable paste. Apply this hair pack all over the scalp, wait for 15 minutes before washing it off. If you have access to fresh bhringraj leaves, the bhringraj powder in this pack can be substituted with it. Bhringraj when used regularly as a hair pack, treats all scalp problems and will greatly help promote new hair growth. Even with hereditary baldness, regular use of bhringraj will have a positive effect. I would suggest using this hair pack weekly once or twice for best results. Regular use is the key to getting the full hair benefits of bhringraj. If using fresh plant paste, both varieties of bhringraj plant can be used. Bhringraj powder can also be added to natural hair dyes too. Bhringraj is a liver tonic. Like keelanelli, bhringraj is also used widely for treating liver disorders. When compared to our elders, we are increasingly eating out nowadays. Regularly eating junk food or food that has been mass produced that emphasis only on the taste plays havoc with our liver. Last week, I was talking to a person who cooks regularly for marriages about adding synthetic colors to food. He said that not only him but almost all the cooks that he knows off adds synthetic colors to all the chutneys, sweets, even certain gravies to get the appealing bright color. No wonder each time we have food outside, the next day we feel so sluggish and tired. One best remedy is to include liver cleansing herbs in our diet. Adding bhringraj to our diet keeps our liver healthy. You can simply steam the finely cut and cleaned bhringraj leaves in a steamer and consume. It can also be had along with dhal or as a stuffing for bread, roti, etc. 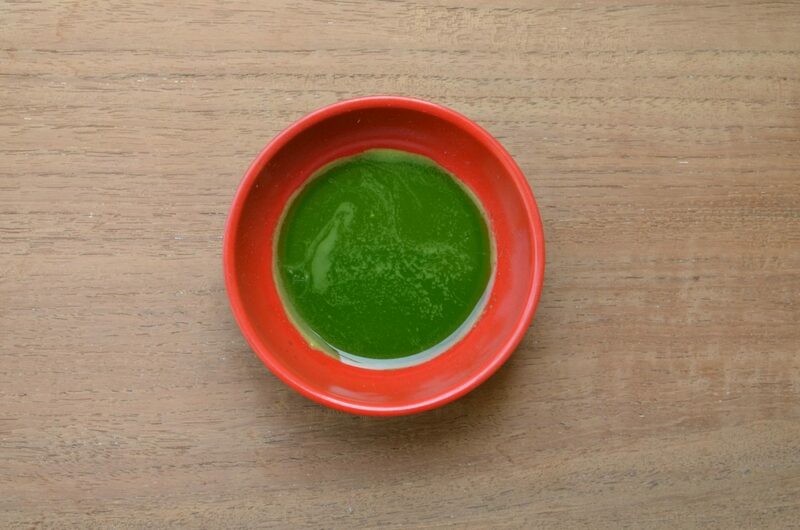 It can be used as a substitute in any recipe that calls for palak| spinach. Try to use bhringraj at least weekly once in the diet. 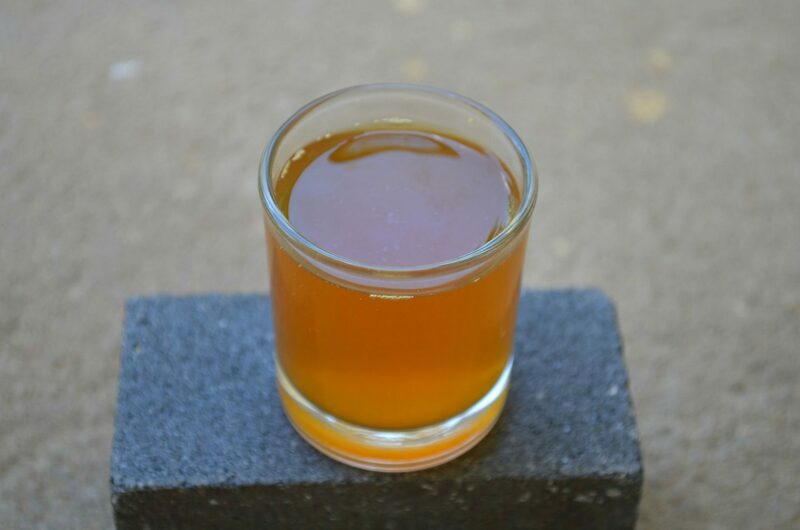 In our village, the water decoction of equal parts of bhringraj and keelanelli along with tiny pinch of turmeric is used as a remedy for treating hepatitis. In my personal experience, home remedies work wonderfully for skin related diseases. Bhringraj leaves are amazing for treating all minor skin related diseases as it has wonderful anti bacterial properties. Bhringraj juice is very effective for treating cracked heels and minor skin allergies. To get the bhringraj juice, take the fresh leaves of bhringraj plant, wash and pound it in a mortar and pestle as finely as you can. Now take the pounded mixture in a strainer and press with a spoon to extract the juice completely. Apply this juice directly on the affected area continuously for a few days to see results. This juice also helps in faster healing of wounds and it is best applied when it is fresh. We also use bhringraj while making kajal, we apply the keelanelli juice on the brass plate and place it over a small lamp that is filled unrefined sesame oil. Once the soot is collected, we take it in a plate and mix it with ghee and use as kajal. Kajal made with keelanelli has a cooling effect on the eyes. Bhringraj is great for treating cold and cough. For the remedy, take a handful of fresh bhringraj leaves in a mortar and pestle. Extract the juice by pounding it along with little boiled water and strain. Now add a few drops of honey to this strained mixture. This mixture is very effective for treating cold and cough. This remedy can be given to both children and adults. This mixture should be consumed once every day for 3 days in empty stomach for best results. A simple homemade soup made with bhringraj leaves treats anemia very effectively as bhringraj is very high in iron. To make the soup, heat little bit of homemade ghee in a pan and season it with cumin seeds. Once the cumin seeds splutter, add 1 finely sliced large onion, 2 finely cut garlic clove and then 1 small tomato. 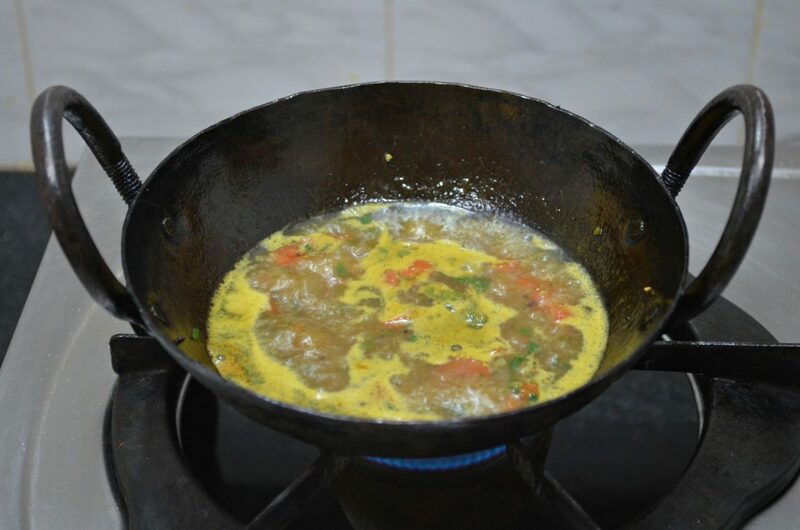 Saute well and add the bhringraj leaves. Once it is fried well, season with salt and pepper. Add water till it is fully immersed in water and boil for 10 minutes or pressure cook for 2 whistles. Switch off, mash it with a hand blender and strain. This soup if had daily for a few days will treat anemia very effectively. Bhringraj is very effective for treating sinus infection. For the remedy, take a handful of bhringraj leaves in a pan. Pound 1/4 tsp peppercorns coarsely in a mortar and pestle and add it to the bhringraj leaves along with 3 pinches of organic turmeric powder. Boil till it reduces in quantity and strain. This home remedy works very well for treating all sinus related problems. But make sure that the peppercorns are coarse, else the mixture will be very spicy. This remedy can be used for young children too but reduce the quantity of peppercorns…..
Hey wonderful post. Normally from where can we get this plant? you will find these plants near places where water is abundantly available, like near Ponds, Talabs, open drainage gutter surroundings and along the paddy cultivated areas. If you are from Hyderabad I can help (9704725526)you in getting powder of these leaves. The above said remedy is really good. We have used it at home and had good results for me and my family members. Guntagalagara plant is water type of plant and it will be available just before paddy harvesting period and will die soon. Better way of utilizing it is its powder which also works as good as green leaves. It's a wonderful medicinal plant. Time tested. Thank you ramya for your wonderful post. Unfortunately all the bhringaraj plants i collected died in spite of regular watering. Will try to make this oil as also incorporate in diet. Do you know how it can be used to dye grey hairs. Aparna, I have heard about it, but I have not tried it for dyeing the hair………. 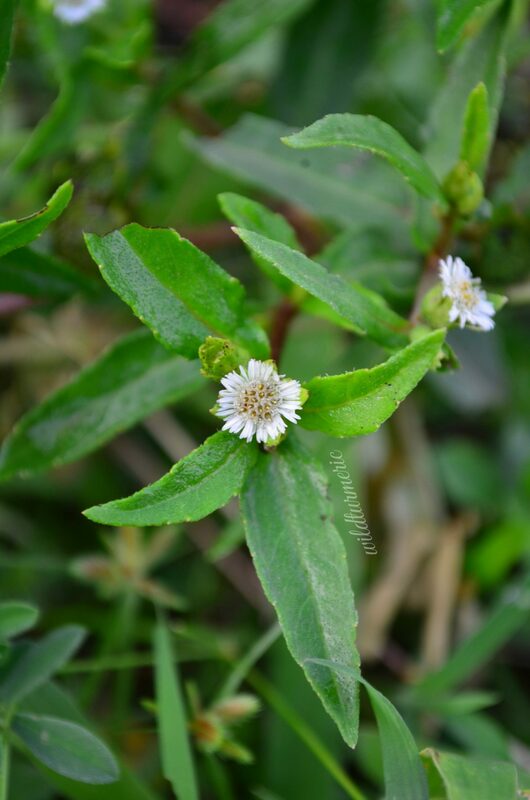 Hi Ramya, I tried to find the bhringaraj plant to grow it at home in US, but i could find only the seeds of eclipta alba…Can this be grown in a garden pot? Hi, Bhringraj can be grown in large pots using the seeds but it needs sunlight or partial shade to germinate and from what I read the ideal temperature is 95 degrees F. Give it a try if the climate is ideal…. hi ramya i have hair loss problems i not go with any treatments for hair therapy and i was prepared my self in home made oils that is amla,maruthani,methi and kattralai but still my hair growth not increased .the bringaraj how to hellp my hair..
Hi, Regular use of bhringraj hair oil does arrest hair fall. In addition to this develop the habit of having oil bath weekly twice. It is a great stress buster, as stress is one of the main cause of hair fall…. Hi Kalpana,Try this plant in the herb section in the nurseries in Bangalore. I don't think the oil made with the powder will be as effective as the leaves. But you can use the bhringraj powder for internal consumption, here in Tamil Nadu we get the powders in small packs in all the departmental stores. Try the nilgiri store for the powder, if not try the ayurvedic medical shops (country medical shops) in Bangalore…..
Hi my hair whitening very fast. How can stop & change color white to black by use of bhirngraj. Try using the bhringraj hair oil regularly at least for a few months……. Hi Ramya, your post is very nice, can you please tell the remedy of hair dyeing by using Henna and Indigo leaves, instead of hair colour, specially for blackish look?? Hi Nasir, I will do a separate post on hair dyeing with henna and indigo very soon…. Hi ramya.. im consuming bhingraj leaves evryday a little sundried for my hairfall problem… I stil dont see any changes… will having leaves that are sundried help me with hairfall? Hi, You can consume dried bhringraj leaves for hair fall. But the first step to stopping the hair fall is pinpointing the problem, try to check for any deficiencies. If you have huge amount of hair fall, rectify that by taking supplements along with taking bhringraj leaves and a good diet. If you don't have any deficiency, check for scalp problems, it can be easily rectified with appropriate home remedy…..
HiI have problem from last few months and i am using this oil from last 3months.i didnt notice any stronge effect yet.you tell me only oil is good or i have to take powder too for internal strenth of hairs.how much time it will take to grow hairs. hi, i am 24 yrs old and m loosing my hair follicle very fast… is there any treatment through which i can regain my hairs and hair follicle… . If it is male pattern baldness which is due to DTH hormone, there are few natural things that you can do at home. Drink green tea or take pumpkin seed oil regularly as they are natural DHT blockers and have been proven to help hair loss. Additionally try homemade hair packs ( I would suggest fenugreek hair mask) and regular pure homemade hair oil application to strengthen the hair roots. Hi mam,My frnd suggest me to apply bringraj oil..i had apply this bringraj mixture with pure coconut oil and I apply to head..but after I getting more hair fall on this mixture..why? ?..it doesn't suit with south indian climate..i m in Pondicherry..pls advise.. Using bhringraja in the form of hair oil prevents premature greying of hair and helps maintain the natural color of the hair. It also conditions the hair really well. hie, i am 24 years old, my hair is geeting white, do this old will change white hair to black hair. Madam, i am 39 years now i want to know that which kind of white or yellow bhringraj is to be eaten. hi, can i use powder for making oil ? please tell me how to prepare that oil with powder too !! Hi Ramya can u explain the second method you mentioned above? How to make oil ? Try this oil along with fenugreek hair mask from the blog, it is very good for dandruff &hairfall…..
Hai sister i am 20 year old .. just 3 years before i had thick hair.. now it fully falling now. My question the oil will be help to grow again.? There is any chance for grow again after fallen. ? I heard somewhere there is no chance to grow agian after fallen please can you help me..
Hello mam, after having baby I just started hairfall and now my hairs come in hands whenever I comb or touch. I buy oil bottle which has roots in it. Will it helpful. Pls let me know. I'm from Punjab. Dear Ramya, My customer saw me scratching me head endlessly and he gave me this oil (Karisalankanni) and I follow his instructions to applied. After applied on it yesterday which is 1st day, it work like magic. Today is the 2nd day of it and no more sctatching!! I had seen many skin doctor and all the drugs (injections, intake and lotion etc…) I had use was useless.According to doctor, I had Ezcema as I have rashes on my body too. How can I recover from this skin problem?? Please help!! Hi I am 24 years old..I am having high hair fall..my hair are very dull and dry also. Which shampoo and oil I should use…presently I am using coconut oil. Which company bringraj oil is good? Thank you so much for your reply.By little bit research on DHT blocker I found “NuHair DHT Blocker” is a good product. Its easy to intake, economical and gives good results to people. But I also want your opinion on this product befor buy and also other than this product if you want to give any other suggestions to intake DHT blocker so please give me ma'am.Thanks again!! I like the tablets you mentioned as it is made with natural DHT blockers like saw palmetto. But though the tablet says all natural, I would strongly suggest consulting a physician regarding the tablet before having it regularly as it has to be had regularly for months together to see results…..
My son is 11yr old his hairs are thick but I noticed lot of dandruff in his hairs . Please tell me how to reduce or irradiate dandruff. I have yellow karislankanni leaves in my garden can I prepare oil as per u r post . Guide me. Hi Ramya, I made this oil with fresh Bhringraj leaves but I guess I did it for little longer and the leaves got burnt. I have filtered it but can I still use the oil or should I discard it? i am facing hairloss telogen effluvium after recover from dengu approx 200 strands per day earlier i loss only 5 to 10 hair per day my hair loss continuing 1 and half month. i am 22 years female .i trial allopathy and homeopathy treatment but not get any effective result recently i use bhringaraj extract with water i need ur valuable suggestion pl help. It can be best used as a beard oil for promoting hair growth…. Hi Ramya, do you think it would be best to purchase Bhringraj liquid extract (tincture) oppose to the powder? I don't have access to the actual plant so I need the next best form of Bhringraj that is potent. Hi Friends,I was facing hair loss problem from one year,I tried this oil which helped me a lot.which I am sharing with you all..Heat some coconut oil and into it add some curry leaves,henna leaves,shoe flower leaves and shoe flowers,methi seeds,Bhringraj leaves,aloe Vera pulp, and saga leaves. Let it cool completely and after that add some almond oil,castor oil,mustard oil and olive oil.FIll it in a bottle.when ever needed take some oil apply it to the scalp and give a good massage. (if you do not get other oils coconut oil is enough)Thank you VIDYA. Can I drink bhringraj powder with water to stop hair fall and for re growth? Is there any side effects of drinking this? I read somewhere that one should avoid milk products and sugar when taking bhringraj churna internally, can u please clarify? Thank you. hi..i have a doubt..have u heard of Alternanthera sessilis leaves( PONAGANTI AAKU IN TELUGU)..those leaves they look similar to bhringraj leaves…i just saw Alternanthera sessilis images in google..they look same and it has white flowers also…..can u pls tel me how to differntiate between bhringraj leaves(GUNTAGALAGARAAKU) and Alternanthera sessilis (PONAGANTI AAKU)..because one of my relative has me given me some leaves saying bhringraj leaves…but am not sure of it for bhringraj ..u will know about it from wikipedia also..pls tel me how to find out if its bhringraj or ponaganti aaku..
Dear Ramya,I would like to first thank you for your time in helping out others. I am 30 years old and for past one year, my hair started changing grey very fast and now almost the entire front portion of my hair is white. IT makes me feel very embarrassing when i go to office or meet my friends, it makes me feel very old. i started using henna but when i go to the hair stylist they say that the ph level in henna is too high and it will damage the hair and scalp and over a period of time it will stop the entire hair growth. i used other colouring products available in the market as well but nothing works for more than 2 weeks. Is there any natural way of colouring my hair or can i use organic hair colurs without ammonia available in the market. please suggest. I am so very sorry, as I haven't tried any store bought bhringraj oil I don't know how effective they are. 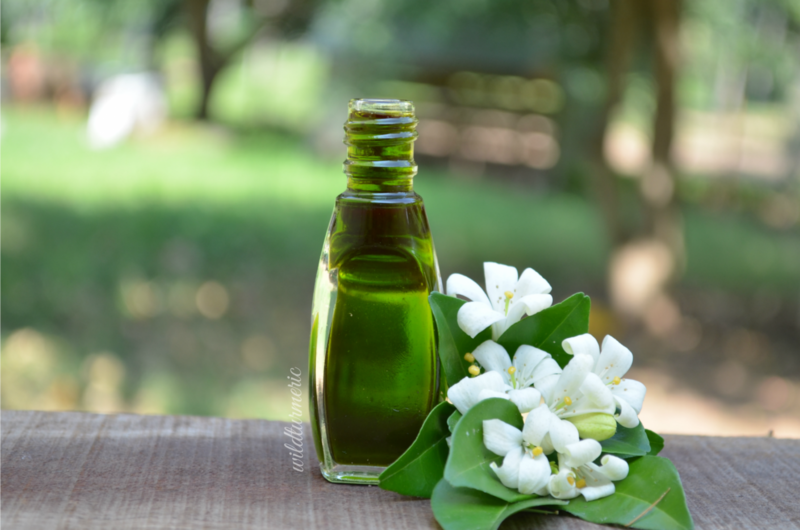 Bhringraj oil does help reverse premature greying, curry leaf hair oil (recipe in the blog) also works really well…. Hello Mam,I am 24 years old guy living at Chennai. I had beautiful Curl hair , 3 years ago. after that my hair has become very thin.It seems to be Diffused Pattern Alopecia. I think i have lost almost 30% of hair at my scalp from temples to crown area. I used Indhulekha Oil. There was no improvement,though it contained bhingraj oil. I used to wash my Hair thrice a week with Sheekai, hibiscus, paasiparupu powder and Nirozal shampoo(alternate days). I fear of losing my hair. I don't have any family history of losing Hair. My Maternal grandpa has lost hair after reaching the age of 50 years only. Now on searching the web,Eating I found that pumpkin seeds at morning helps for Hair Growth and also karislankanni powder with honey cures Hair loss at empty stomach. Is there any other suggestions to stop hair thinning and regrow my hair. Please help me get out of this. Hello Ramya Garu, I am 23 years old and suffering from scalp inflammation and itching due to some fungus spread on scalp. I lost my hair density. How to control and get rid of scalp fungus and regain the lost hair?? I use neem oil as I heard it has anti-Bacterial and Anti-Fungal properties. Could you suggest me suitable routine/therapy against this problem?? Can I get it from market. Try using indigo along with henna to get dark color. 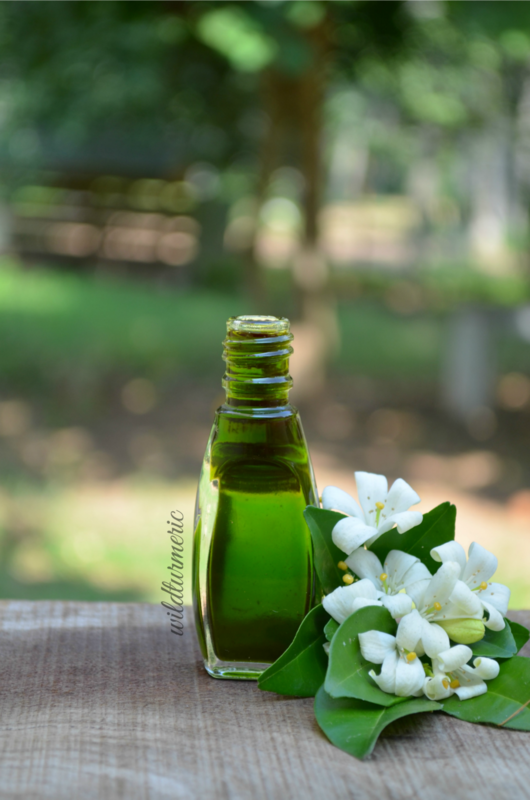 Also I would suggest using curry leaves hair oil from the blog too…. What is the kannada name for bhringraj leaves? Hi mamI am 36 year old male from punjab. In 2009 I met an accident with the result of which I have a problem in my whole left side. by time it heal somehow but the problem is my mustache and beard and chest are getting white specially chin and throat As I belong to sikh family I can't shave it. Now the problem is my marriage every body reject me as they said I am very old looking person. Please help me. HI mam i am severely worying about my hair from the past 2 years and i am trying to use the Dabur almond hair oil and it is a little bit helpful and and after that my hair was so thin and front part hair was growing very slow so please suggest me the good hair oil which will be helpful to grow the hair shine and strengthn and silky. Hi Mam i am worrying about my hair from the past 2 years and my hair was was not thick and from the past 2 years i am using the Dabur almond oil and in my head all the regions in my head was not grow the hair properly.please suggest me to grow my hair fast and thick and shine.suggest me the hair oil to prevent the hair fall and dandruff. Hiie Mam, I want to know dat is this oil applicable for facial hair growth(beard and moustache)Can we use ??? Without any allergic reaction?? Hi Ramya, I have read all your comments and it was great. Hope u can definitely help me. Iam 32 yrs male and have hair loss and also have round bald patch to size of a 25 paise coin(Alopecia Areata i think). Have these for more than a year and hair loss. Pls can you advise what type of oil to be used for regular applying and also advise what should i apply in that small bald patch to get new hairs getting rid of that patch. Mine is heat body. So pls suggest me suitable ingredients to prepare home made oil for my condition. I would like to use brighraj oil. So pls can u suggest me ingredients for oil and treatment for getting rid of the patch. Awaiting your replies with great anxiety…thanks in advance. Madam, This is regarding Bhringraj, we call it, 'Guntakalagara Aku ' in Telugu. You described methods of making bhringraj oil at home. You suggested that only leaves be used. But in our family we used to make paste of everything i.e.leaves and stems. Yesterday I prepared the oil. I simply washed the entire plant and after a while cut the entore plant into small pieces and ground it to paste adding little water. Then pressed the juice through a cloth. I measured this bhringraj juice and coconut oil in 1:1 ratio and boiled it on low flame till entire moisture is gone. It took 5 hours for me. Then cooled it.Added small quantity of pachha karpuram and preserved. Please tell me if this method is okay. This is our family grandmother recipe. Madam, Please give detailed description of how to make bhringraj powder. Please clarify if the entire plant can be sun dried and powdered. Please go ahead and use the hair oil you mentioned. Recipes like this, perfected and used for years together and passed on to us through family members should be treasured…. The entire bhringraj plant except the roots and the flowers can be used to make bhringraj powder….. I am from kerala. Fortunately, with no care at all, there are lots of Bringraj plants growing in our compound. Once i recognized its power to fix hair problems, i started giving care to them. Can we use yellow bringraj for hair? Yes, you can use yellow bhringraj for hair…. Hi Ramya, while using bhrinharaj powder as hair mask it doesn't get applied properly as the paste from the powder doesn't turn enough smooth. Please suggest the method of preparation while using powder as mask to hair. Hi Ramya. I have started eating 1 spoon brhingraj powder empty stomtach daily with water. Will it show any signs of hair regrowth? How can i got bhirngraj oil..or leaf..
You can get bhringraj plant in nurseries. Also you can ask the ladies who sell greens in the markets to get it for you, usually they will happily do it for a small sum of money.. Yes, you can make bhringraj oil with other oils too but whatever oil you choose, make sure to use only pure unrefined oil…. Hello Ramya, Can we prepare bringraj oil with mustard oil instead of coconut oil. Becoz in winter in North India it will be difficult to use coconut oil. hi mam,I have severe hairfall because of dandruff. how bringaraj is help to me to cure haifall and dandruff? 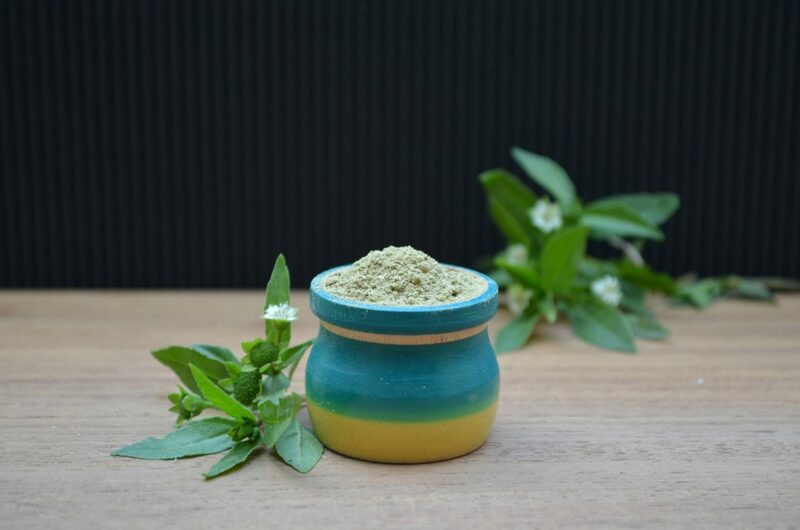 Though regular use of bhringraj arrests hair fall and cures scalp problems, in my personal experience I find using fenugreek hair mask treats dandruff very very quickly (you can find the recipe for it in the blog)…. Hi Ramya,I am 28 yrs old and I used to have thick hair before.. But i started loosing hair from 22 and I have been suffering from female pattern thinning of hair…doctor consultation didn't help..could you please suggest a natural remedy that would help grow the lost hair back..
Hi,Will the bhringraja tablets, that are being sold online give the same benefits as the oil ? For hair growth, it is best to apply bhringraj hair oil externally and take it internally for best results…. hello,can you help me as to where i can find or buy bhringaraj leaves in chennai,thank you,Rajkumar. Hi Ramya, Many thanks for your post.Can i use bhringraj dry leaves with jatamansi. Yes, you can use …. I saw white and yellow bhringraj seeds being sold in some online shops few weeks back, you can give them a try (I haven't purchased them online, so don't know about the quality)…..
Hii mam, I am 23yrs old. Which colour(white or yellow) of bhringaraj plant could be used for getting black hair. Hi. I am 20 year old girl suffering from hair loss. Could you please tell me which brand's bhringraj powder can be consumed for hair growth? hi ramya. what should we do with the solution u gave for sinus? should we want to drink it or steam inhalation or anything else? Hi am having yellow coloured flower plant. Which is best yellow or white.